Please watch the video for all of the versatile looks. The fabric is so soft and flexible. 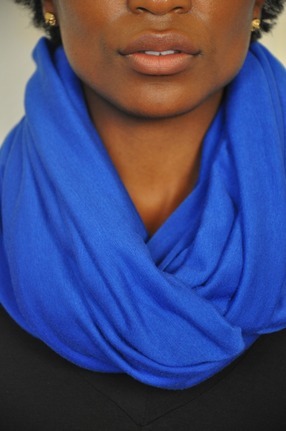 This color blue is absolutely gorgeous - eye catching. It lays absolutely perfect in any style you try. One of a kind. Hand made. Jersey knit cotton. Dry clean only. This is the item featured in the video. Featured on Fashion Law Week Runway Show! Cotton-poly blend. Gorgeous statement piece. It's reversible. Dry Clean only. 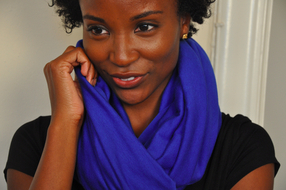 Looking for the perfect scarf no one else has? Grab this one. Only two made. One left. Light weight t-shirt cotton feel. 100% cotton. One of a kind IT Girl statement piece. Dry clean only. 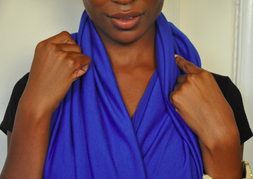 Soft and gorgeous blue - the right blue with black or any color.